The name summer squash distinguishes the more delicate varieties of the Cucurbita family from their heartier and longer-lasting relatives, the winter squash. The entire vegetable, including the seeds and skin, is edible and the soft flesh has a very delicate flavor. 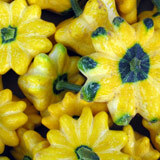 In addition, some varieties, like the zucchini, produce edible flowers, which can be stuffed and fried and wholly enjoyed. When buying summer squash, look for ones that are heavy for their size and have soft, unblemished rinds. Small cuts can lead to quick decay. Also, purchase squash of small or medium size. Larger ones tend to be more fibrous and have larger seeds. Enjoy summer squashes sliced in salads, sauteed over pasta, or cooked into bread.